Hello and welcome to ESPN's live coverage of third and final practice from Shanghai. This is the final opportunity for the team's to fine-tune their set-ups ahead of qualifying. Mercedes look strong going into this afternoon's session but, as we all know, they are now wary of the resurgent Ferrari. I think yesterday proved Mercedes might have a clear run at pole this afternoon but the real concern for them will be the race pace displayed by Ferrari's Kimi Raikkonen in FP2. The Finn has looked quick and consistent this season in the SF15-T.
@HS: People are saying this a lot. It's only the third race of the season and as he said, he didn't want to be at another team that could help him finish second. He's joined a long-term programme at McLaren and we won't know if it was the right decision or not until next season at the earliest. Personally, I'm very keen to see what Rosberg can do this weekend. He's been a bit anonymous compared to Hamilton this year - except from when he's been making a fool of himself in press conferences - and needs a strong weekend. Conditions remain sunny, clear and dry - like yesterday. Love to see Red Bulls Roar! Psssssst, Nate...so...ummm...any of your mates snap a pic of Carmen Jorda today? Now that Sutil's girlfriend is gone it's nice to have Carmen around! The session is under way and Vettel is the first man to dash out in that Ferrari, followed by a Manor. Why is the shorter nose cone so important? @FlyingFinn: There is a growing consensus that the best way forward is the short style of nose pioneered by Williams - but that design causes complications in passing the mandatory crash tests. The reasoning behind it are the aerodynamic benefits a shorter nose brings, you've got to think about the air flow. That's mean Nate...Rosberg making fool of himself !!! Are pit garages chosen in championship order or assigned in order, or something else? Good morning Fernando. We have Alonso on track but there's already a puff of blue smoke coming from the back of his McLaren - disastrous start for the Spaniard. "I have a problem with the engine, I have to stop," says a sheepish Alonso. @SammieSrini: On two occasions he's tried to make jokes (to Vettel in Australia and Hamilton in Malaysia) and both times the two men have made him look a bit silly. You can tell his usually cool demeanour is taking a hit this year. I really hope the Iceman gets back on top... would really like to see him get another crown! The other McLaren of Button is currently circulating. McLaren has a real chance of making Q2 this afternoon so Alonso's troubles in this session will be a real blow. Interesting message from McLaren to Button: "Problem is not fixed, Jenson. Problem is not fixed." Remember, it's a marathon not a sprint for McLaren. They're still running things conservatively remember. Kimi will win Chinese Grand Prix. @rockedin123: It's always hard to tell as Williams does something completely different to the rest on Fridays. I can't remember the last time Williams looked decent pace-wise on a Friday. I expect to see it as close as it was in Melbourne, if I'm honest, as Malaysia is a track which really doesn't suit Williams. @Nate, how true is that hot weather suits ferrari more than others particularly Merc...if so, what are the other circuits that have typically hot and dry weather ?? Any initial assumptions being made about the "cooler" temperatures v. tyre wear? Could Ferrari be in the "cat-bird seat", again? One of the strengths of Allison's SF15-T is its cooling package, but also the fact it is very easy on the tyres. In Malaysia this was crucial as Vettel was able to do a two-stop strategy while Mercedes struggled with deg. This is a cooler circuit and that strength is negated slightly. Ericsson plonks himself top of the leader board with a formative time of 1:42.174,. @TS: It is true. 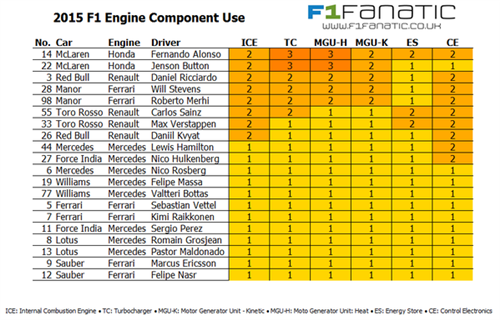 The problem facing McLaren is the engine penalties you get once you have used four power units. For them, turning the revs up fully brings a whole raft of new problems you face when you test the limits of the engine, so at the moment they are focused on making small gains rather than risky big leaps. I think Nico is feeling a little bit down with no confidence anymore. Are there any thoughts at this point to replace Rosberg at Merc? @Mary-Lou: Whenever Mercedes needs a new driver I would expect it to be Bottas. Hi you etrohead studs! now has anyone told the Hammer that 44 is a very very bad number for anyone in Asia. It is frank the number that Honda deserve! Nasr has replaced team-mate Ericsson at the top of the board by 0.03s.